Options: 14 lb. 28 lb. 5 lb. This unique low-fat, low calorie chicken formula can help keep your dog healthy and fit. This great tasting formula reduces fat and calories without reducing the nutrients necessary to maintain optimum health. A blend of natural fibers from vegetables and fruits like peas, apples, blueberries, carrots, spinach and cranberries helps your dog feel full and satisfied while reducing caloric intake. Fortified with glucosamine and chondroitin sulfate, Weight Control formula helps maintain healthy joint cartilage. L-Carnitine helps burn fat and maintain lean muscle mass to support a healthy, active lifestyle. A proper ratio of Omega 6 and Omega-3 fatty acids helps support a lipid balance for healthy skin and coat. Chicken meal provides a high quality protein source. This grain-free formula combined with high quality wholesome vegetables and fruits complete the balance to give your dog the nutrition he needs. Chelated minerals are easily absorbed into the tissues of your dog’s body for optimum nutrition. Formulated without grain or gluten, this special formula is ideal as a grain-free alternative diet. A standard 8 oz. 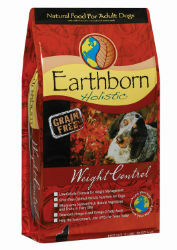 measuring cup holds approximately 3.9 ounces of Earthborn Holistic® Weight Control. 3090 (M.E. Calculated, as fed) kilo-calories per kg/325 (M.E. Calculated, as fed) kilo-calories per cup.